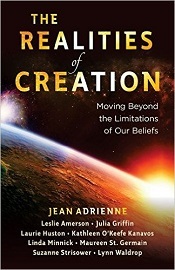 All of the speakers who contributed to our book, Realities of Creation, Moving Beyond the Limitations of Our Beliefs are joining us again with new fresh talks. We know you will love these live, interactive conversations on all the ways you create in your own reality and the special interaction from our speakers. This event is truly a co-creation … as it takes all of our speakers AND all of you listeners to create. We hear your questions and that is what drives our divine connection to provide you with the information you are seeking. To get all the all the scoop on our speakers, dates, show times and links, CLICK HERE to register for this series. Each speaker will have *FREE* gifts for you, available the week they present. May 5 – Thursday – Laurie Huston – Power of the Heart! May 16 – Monday – Lynn Waldrop – You are the Master Creator – Step up Your Game! You won’t want to miss these powerful and inspirational speakers as they share their insight and activations with you. For My Special: Go HERE! This entry was posted in Blog and tagged #RealitiesofCreation, Clearing and Healing Techniques, clearing energy, Intuitive Counseling, intuitive counselor, Jean Adrienne, Laurie Huston, Power of the Heart, Realities of Creation, Realities of Creation Book. Bookmark the permalink.